The Ohio State Buckeyes rolled on to the Sweet 16 today. Next weekend, they will play one of the most storied teams in college basketball — the Kentucky Wildcats — for the chance to move on to the Elite Eight. Tonight the Buckeyes pulverized a game, but totally outmatched, George Mason team. After falling behind 11-2, the Buckeyes came roaring back behind the outside shooting of David Lighty, the inside toughness and rebounding of Jared Sullinger, the dunking prowess of Dallas Lauderdale, and the pinpoint passing and defensive intensity of point guard Aaron Craft. With Jon Diebler making a signature buzzer-beating three-pointer, the Buckeyes led at the half 52-26. The lead never dropped below 20 points thereafter as William Buford heated up, and the Buckeyes ended up winning 98-66. Every player on the team saw significant action, and senior guard Eddie Days had a chance to play and score. Kentucky will be a more severe test than George Mason. The Wildcats were one of the best teams in the SEC. They are led by talented and athletic freshmen, including excellent guard Brandon Knight, who scored 30 points in leading Kentucky to victory over West Virginia. We’ll worry about the Wildcats later, however. For now, those of us in Buckeye Nation will relish the fact that our team is still alive to play again next week. We’ll also join Lighty, Diebler, and Lauderdale in celebrating both a big win and the fact that they received their college diplomas before the game today. On the bus ride from the airport to downtown Athens, I admired the bright Greek countryside, which reminded me of west Texas. 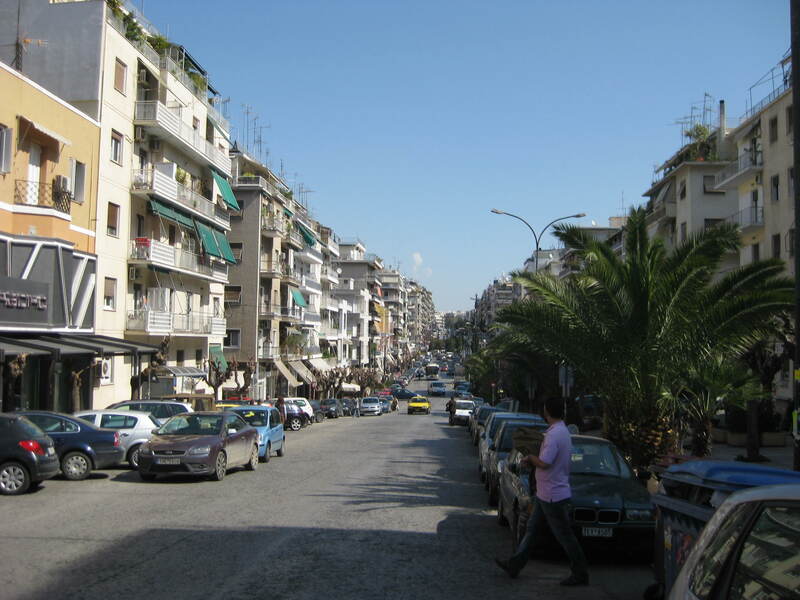 Then we entered Athens and the landscape changed to that of a dense, chaotic city. Now that I’ve been here a week, it’s hard for me to believe that such a calm environment is only a few miles away. A typical street in Athens. Athens makes Istanbul look like a tranquil Midwestern suburb. 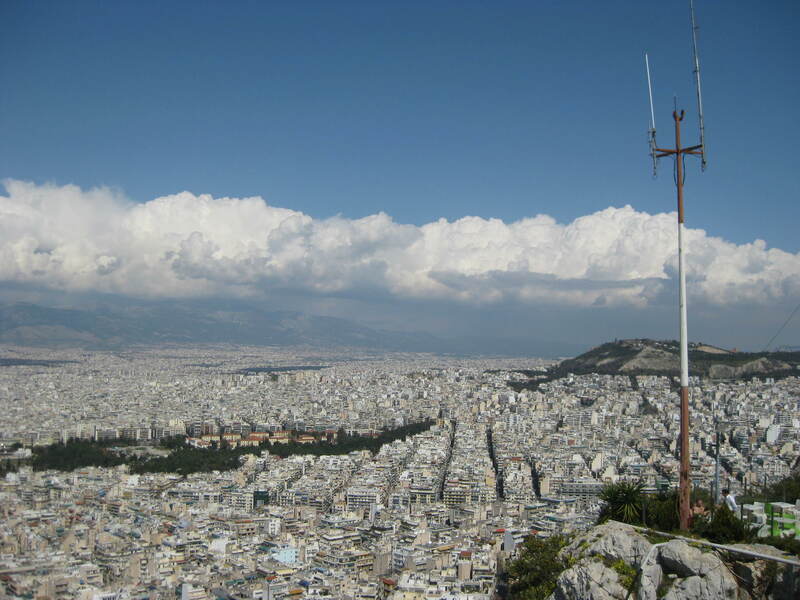 Apart from the Acropolis and a few parks scattered here and there, the city is packed with three-to-seven-story apartment buildings. There are no gaps in the buildings to see landmarks through, so it’s easy to get lost. The sidewalks are so thin that you often have to walk on the edge of the street to avoid people. Cars are parked bumper-to-bumper along the curb, sometimes in two layers, and usually blocking crosswalks. The traffic is merciless; on my first day, I witnessed a car accident, and I was almost hit while crossing the street yesterday, though I was obeying the walk signal. Speaking of walk signals, there’s no flashing transition between “walk” and “don’t walk”, which has caused me a lot of consternation. Yet, despite these annoyances, or maybe because of them, Athens comes off as a happy, pleasant city. The ubiquitous apartment buildings obviously weren’t designed with much concern for their appearance, but I think they help give Athens its happy vibe. They are usually covered in stucco painted eggshell white or a light pastel color, which makes Athens bright and glimmering in the sunshine. There are balconies on every floor that are overflowing with plants and often have clothes drying in them. I like how the presence of so many people has turned these bland, utilitarian structures into ones that are visually buzzing with human life. While traveling from Istanbul to Athens, I became worried, wondering, “what if Istanbul was an unusually good experience? What if there happened to be people I got along with in my hostel there, but now I’ll be with people I don’t jive with?” However, I liked my hostel in Athens more than the one in Istanbul, and I became better friends with my fellow guests. I stayed at the Pagration Youth Hostel in the Pagrati district, about a half hour walk from the Acropolis. I was friendly with some people I met in Istanbul, having lots of interesting conversations, but I never truly became friends with them. In Athens, I developed close friendships with most of the guys who shared my six-bed dorm room – friendships of the inside-joke, get-acquainted-with-each-others’-foibles, fill-a-certain-role-in-the-group variety. The first guy I met was Chris, and 18-year-old from Bath, England, who is traveling around Europe and the Middle East before starting college, or uni as he calls it. He left for Egypt yesterday. Also in the room was Tery, nicknamed Tery the Lion. Tery is a balding, middle-aged Greek who is rather funny. Halfway through the week, I was looking at a bulletin board in the TV room with old pictures of former guests hanging out in the hostel, and I noticed that Tery was in many of the pictures, even though they appeared to be many years old. It reminded me of the end of the Shining, when the camera zooms in on a picture of a party from a hundred years ago with Jack Nicholson in it and you realize his character was a ghost that haunted the hotel. However, the explanation for Tery’s presence in the photos was more prosaic. He travels around Greece all year for his job, which involves distributing pamphlets or something, and he always stays at the Pagration hostel while in Athens, so he has been there many times over the years. I shared a bunk with an Austrian dude named Clarence who is riding a motorcycle from his hometown to India, traveling through Saudi Arabia to get there. He left for Turkey in the middle of the week. There was also Paul, a former Navy man. In a series of debates we had over my stay, Paul gradually revealed his bizarre belief system. Despite being American, he labels himself a Monarchist. He has a fanatic love for the British monarchy, especially Henry VIII. If you say anything bad about a British monarch, he stares intensely into your eyes and tells you you’re committing treason. Last night we all went to a bar and Paul bought everyone Ouzo, a vile form of alcohol that tastes like black licorice and is responsible for the hangover I’m nursing right now. The Pagration hostel is much nicer than the one I stayed in in Istanbul; if I rewrote my post about Istanbul now, I would probably give a harsher opinion of that hostel. The management at Pagration would never force me into a worse room than I reserved, like they did at my hostel in Istanbul. There are noise restrictions that make sleeping more pleasant. Like Athens itself, the hostel has a dense human presence. There are pictures, posters, and handmade signs everywhere. It is a tradition for guests to write their favorite quotes on masking tape (such as “Life is what happens when you’re making other plans – John Lennon”) and stick it to the wall of the kitchen. However, the hostel doesn’t offer free breakfast, there’s no computer, and you have to pay fifty cents for hot water in the shower, which particularly irks me. The hot water only lasts seven minutes – not quite long enough for a comfortable shower, in my opinion. Trust me, you do not want the hot water to stop unexpectedly. I didn’t have a fifty cent coin when I arrived, so I used the cold water for the first shower. The water was so cold that I could only bring myself to wash my hair and my armpits with it, and it gave me brain freeze. A few days into my stay, I learned that you can buy a delicious gyro – juicy chunks of chicken or pork in a pita, with tomatoes, lettuce, french fries, onions, and whatever the gyro sauce is – for only 1.5-2 euros. I’ve been eating at least one gyro a day ever since. It sure feels good to have one of those gyros in your stomach. The Parthenon on the acropolis. The first sight I visited was the acropolis. Despite all the abuse the Parthenon has endured over the years from neglect and invading Turks, it is still awesome in the original sense of the word. Most of it has collapsed, but it still appears firm due to its thick, bulging columns. 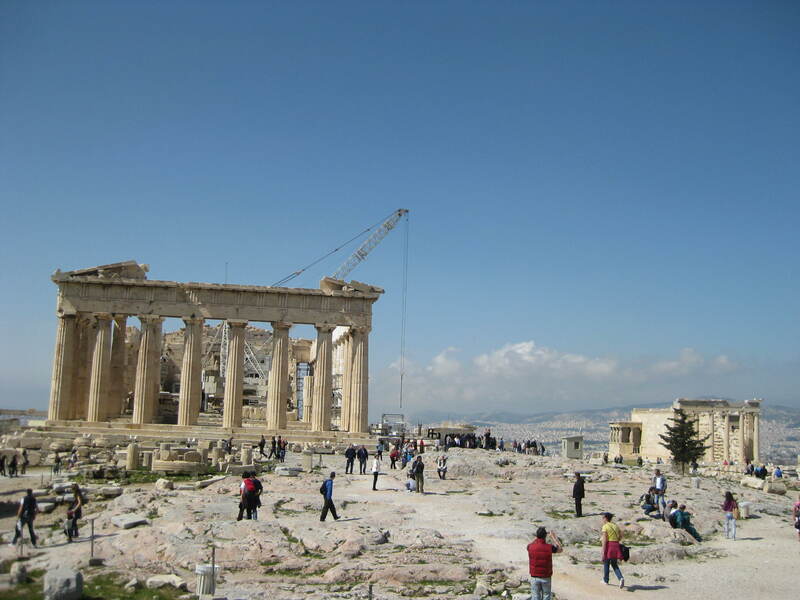 Unfortunately, the acropolis was crowded with tourists, although I went on a weekday. It was impossible to walk a few yards without walking into someone’s picture. I tried to sit on the outskirts so I could contemplate what I was seeing, but someone came up to ask if I could take their picture. So instead I contemplated the fact that people take too many pictures. It seemed to me that many of the people at the acropolis that day saw it mostly on their cameras’ digital screens. I noticed lots of people filming videos of the buildings, zooming in on details. What is the point of doing this? You can find detailed pictures of those buildings on the internet. The next day I went to the recently opened Acropolis Museum, which is in a beautiful, sleek modern building. Inside, there was a great collection of ancient Greek pottery and sculpture from prehistoric days to the late Roman empire, including many that were formerly in the Parthenon. The museum was cleverly designed to offer views of the nearby acropolis, so that you could glance at it while reading about it. I would recommend going to this museum before the acropolis, because it gives you a good understanding of its history and the purposes of the buildings. The view from the hill of Lycabettus. Yesterday, I was walking around the city when I decided to see if it was possible to climb a steep hill a half mile away from the acropolis. Indeed, there was a trail going to the top, and when I arrived there I was rewarded with one of the most spectacular views I’ve ever seen of a city. 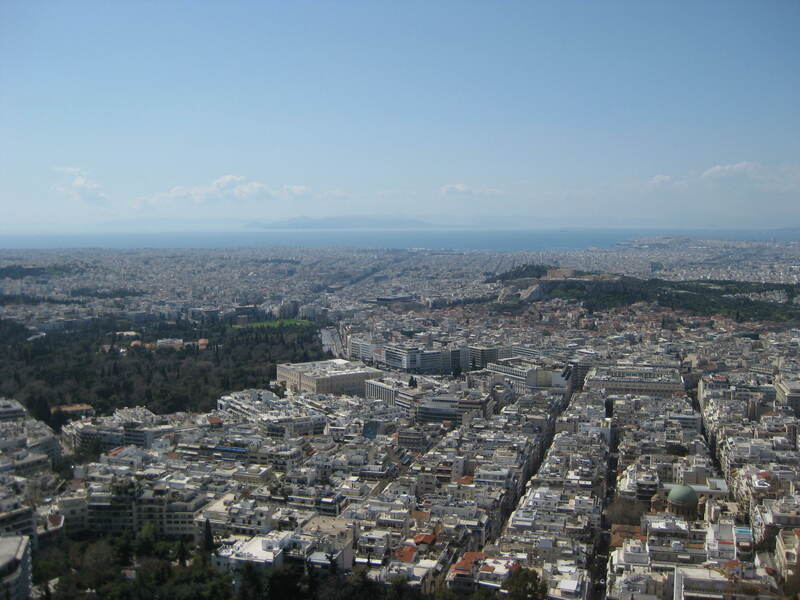 Athens sprawls for miles in every direction, stopped only by the sea and the mountains, and it seems to consist of the same dense white apartment buildings all the way to the end. Yet, the acropolis still occupies a prominent place in the midst of all the modern buildings. NASA’s Messenger spacecraft has achieved orbit around Mercury. It will remain in orbit for about a year and will circle Mercury 730 times. Its mission includes taking photographs, collecting data about Mercury’s surface and atmosphere, and trying to figure out why the planet is so dense. Scientists currently believe that two-thirds of the planet’s core must be some kind of iron composite. Mercury’s density is just one of many intriguing aspects of the planet. It is the closest planet to the Sun — if you could stand on Mercury, the Sun would look at least three times larger than it appears from the surface of Earth — and it experiences extraordinary heat variations. When Mercury’s surface is exposed to the Sun, temperatures can reach levels sufficient to melt lead; on the dark side, temperatures can drop to -280 degrees Fahrenheit because there is no atmosphere to retain the heat. Mercury has the fastest orbit of any planet, circling the Sun once every 88 days. In addition to being blasted by heat, its surface is scourged by the solar wind and pockmarked with craters from countless collisions with comets, asteroids, meteors, and other space debris attracted by the Sun’s immense gravity. The extreme conditions on Mercury posed significant engineering challenges for mission engineers. How do you design a spacecraft that is durable enough to be launched, hardy enough to be flung around planets in order to reach the right velocity and insertion point for orbit, and tough enough to stand up to Mercury’s metal-melting temperatures, yet capable of performing scientific experiments that require delicate measurements by sensitive instruments and then transmitting the results of those experiments back to Earth? One answer was to use ceramic shielding and mirrored surfaces to guard instruments and reflect heat rather than absorb it. Another answer is for the spacecraft to do its transmission duties when it is farthest away from the planet and least exposed to the intense heat. The Messenger mission is another example of how we get great “bang for the buck” from unmanned space exploration, and how the exceptional engineering work that characterizes such missions can help point the way to technological breakthroughs and creative solutions to engineering problems on Earth.